I’ve only cut a couple of sets of dovetails with the jig, but enough to give an overview of set up etc. Until now I’ve not attempted cutting dovetails in any other way, with power tools or by hand. This is a review of the Craftex CT052 dovetail jig. It is designed to accommodate pieces up to 12″ in size. I got mine on special offer from Busybee Tools for $80 (+tax) CAD. The Craftex CT154 can go up to 24″ and is available for $189 (+tax) CAD, although at the time of writing there was a $20 off sale. 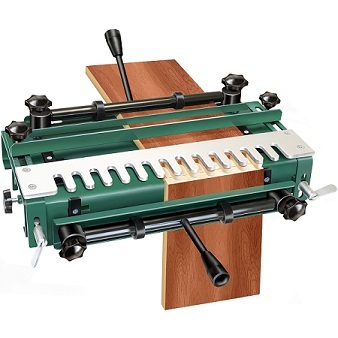 Both these jigs allow you to cut both pins and dovetails at the same time on the same pass. Some people online have commented that whilst they may own a cheap dovetail jig, they’ve usually hated the things for some reason. It maybe because they have found them difficult to set up, or they are not very flexible. Having watched the video (see the link below), I found the set up pretty easy. I would however agree that they aren’t very flexible. Out of the box a minimal amount of assembly is required. There are two clamp levers that need installing, and two thumb screws on the side. When you screw the clamp levers on, make sure you screw them in the right way round so that when the clamps are applied the long handles don’t obscure your work. (Which is what I did when I first put it together). The thumb screws on the side prevent the template gantry from moving during routing. There are a number of templates available usually for around the $25 CAD mark, but it comes with a 1/2″ blind dovetail template already installed. The body is made from steel, and has quite a bit of weight to it. 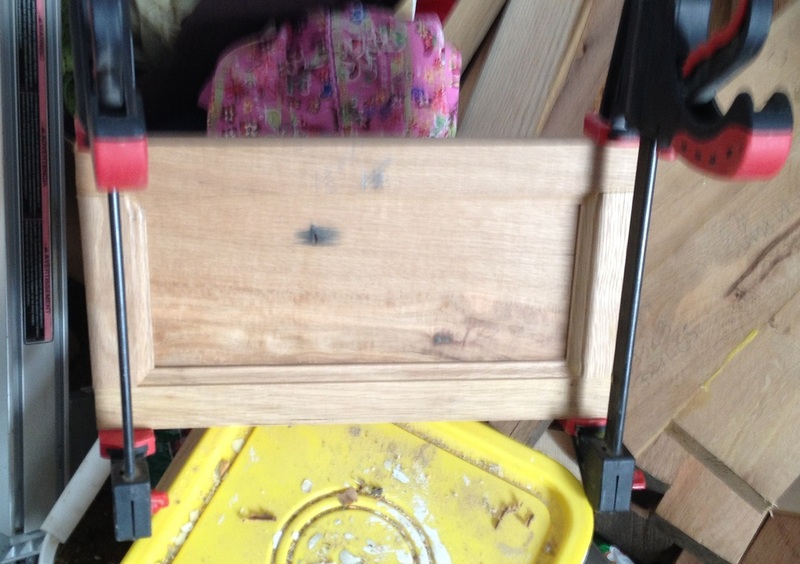 There are two holes in the metal at the back feet you can screw onto you bench or into a piece of plywood. 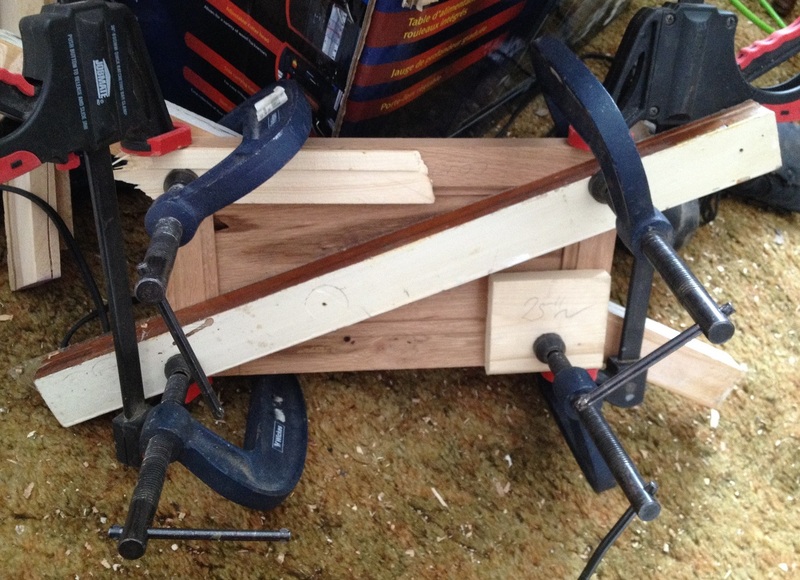 The feet aren’t big enough to use to clamp the jig to the bench. That said, I’ve used the jig a couple of times and I’ve not really noticed movement to be a massive problem. The only time the jig moved was during the initial scoring cut, where you’re moving laterally across your stock. There are a number of plastic parts which are for the most part fine. My only gripe on this front are the four stop blocks used to place the pieces in the jig. They are made of plastic, when they really should have been made of aluminum or steel. They are such an integral part where accuracy is needed. That said they are fine for now. I might replace them later if I really see a need. Confession: I’ve not read the manual. I did watch the video (see the link below) and found that to be an awesome guide. Mark Eaton from BusyBees does a good job of walking you through the set up. I don’t have set up bars that Mark uses, but a 1/4″ and 1/2″ drill bit do a good enough job of getting everything in the right place. My only criticism of the video is that during the setup half, it doesn’t discuss the fence at all. The fence is only mentioned very briefly at the very end of the video. If your dovetails are not tight enough, raise the router bit. Too tight, lower it. As with all jigs, some test cuts are needed to get things right. 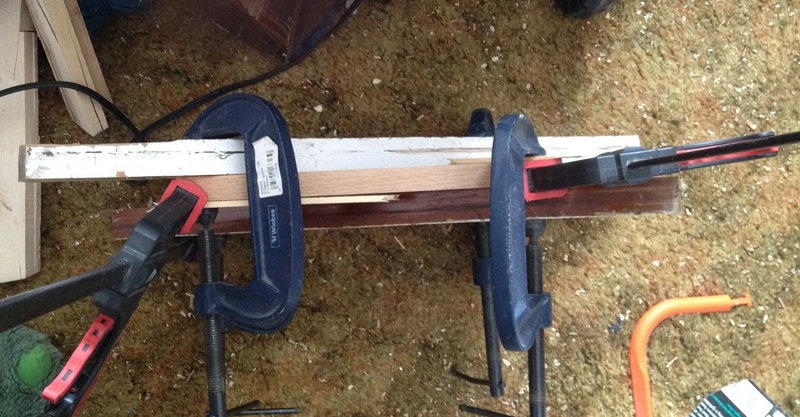 I positioned the two pieces of stock in the clamps, vertical pieces first. There is a little frustration in positioning the vertically mounted pieces. Gravity has a way of taking hold! Mount the vertical pieces first, tweaking the screws on the clamp to hold the pieces in place before locking the clamp down. If you are doing a small box/drawer you will find that you can only mount the short pieces in the vertical mounts. My test pieces had a 5″ side, which is too short to go in the horizontal mounts. The video recommends doing a gentle scoring cut on both work pieces first to help with tear out. I don’t know if it was the cheap pine I was using, or I didn’t do enough of a score, or it’s the jig, but I found a little tear out on the right hand side of both sides of the cuts. More attempts will with harder wood may tell. Having cut the first set of pins and tails I removed them from the jig and noticed my first problem. The fit was tight enough that I needed to use a mallet to push the pieces together (perhaps a little too tight as it might squeeze all the glue from the joint). As I’d been following the video, and didn’t really understand what the fence was for, my tails were cut too deep, resulting in the tails sinking too deep into the box by just under 1/8″. This resulted in me sanding off the extraneous tails. 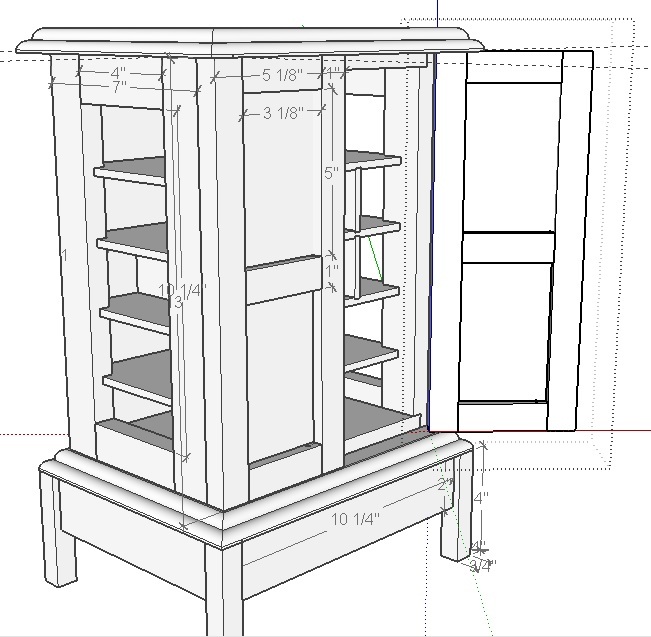 Not a problem with a box, but if your drawer needs to fit in gap, you’ll be 1/4″ too narrow. Once you’ve done one test cut, you can see how much you need to move the fence by and then use setup bars (or in my case, drill bits) to help with that placement. I then made the mistake of not watching which way round I was putting the vertical pieces back into the jig, and cut the pins the wrong way round, resulting in a question mark shaped “box”. Lesson learned. I also found that one of the stops on the left hand side of my jig was not in quite the right place, resulting in a step between the two pieces. So I wouldn’t have been able to complete my first box anyway. I went back through the very easy set up of the left hand side of the jig, and proceeded to make my second set of cuts. Everything went smoothly although again there was a little tear out on the right hand side – which makes me think it’s my technique and will probably be resolved with practice. The resulting box (which I have glued up, but not taken pictures of) is square without any need to tweak the joints. I did note that the second cut was far looser than the first. So much so I was very surprised when it came out square first time! Dust collection – none. I was sprayed with pine fibers from head to toe. It wouldn’t be hard to create a shroud around the jig. I might make one if I find myself using it a lot. There’s no point in putting a shroud on the tool itself as you need to use a guide bushing, and the router rides on the template meaning there’s very limited air flow. Quick to set up. I managed it with the video guidance in an hour or so if you include the time to reset the left hand guide blocks. It is very limited. You can only cut even spaced 1/2″ dovetails. This can mean the edge of your project can have half a pin exposed on one of the corners. This means you either put up with it (or arrange it so all the halves are concealed in some way), or design your project with this in mind. Generally I like the jig. You can cut both pins and tails at the same time making work very quick. This adds to the limitations of the jig, but at the moment it suits me. The video is worth its weight in gold. It gave me a lot of confidence to try to fix things when they didn’t quite fit. I wish the setup blocks were not made of plastic. Otherwise the build is of reasonable quality given the cost. 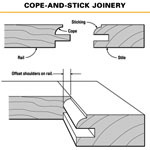 You can only cut half-inch, evenly spaced, half blind dovetails – which means there is a tendency to design the work around the jig. If you don’t already have a half-inch dovetail bit, and a 7/16ths outside diameter guide bushing. I happened to already have both of those so I wasn’t more out-of-pocket than the $80 I spent. I might actually have to read the manual. I’m going to build a few boxes with hard wood. I’ve got some cherry and birch which I can play with. I see small boxes for my family for Christmas on the horizon.